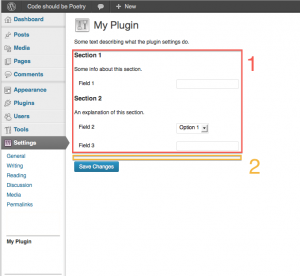 The WordPress Settings API can be used by plugins and themes to easily create settings pages. The API lets you create settings fields and assign them to a form. The API handles the form submission. 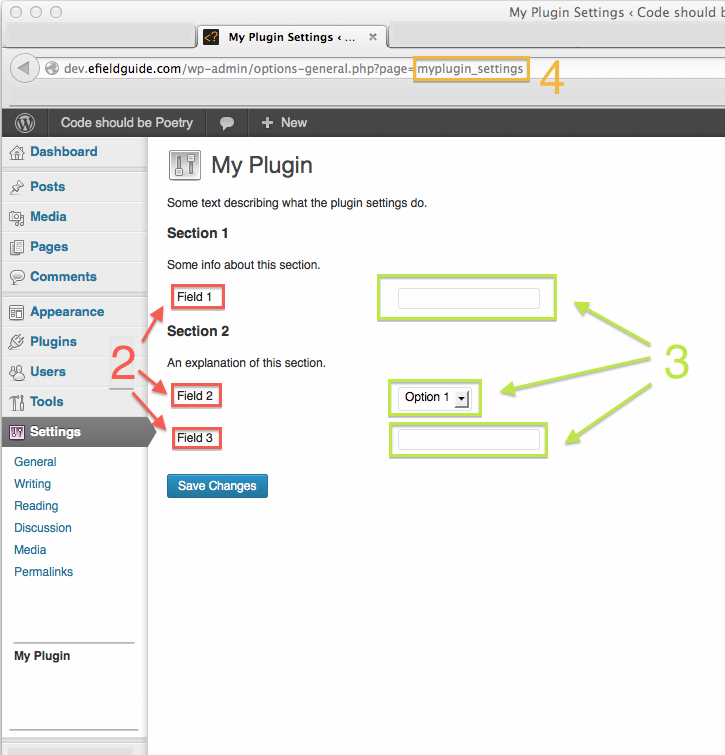 This is a really great developer helper, and it was added in WordPress 2.7. I was working on a plugin recently that needed to have a settings page. 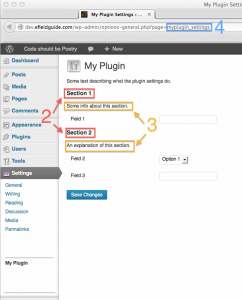 So, I took a look at the Settings API in the WordPress Codex. Then I looked at the various tutorials on it. In short, I couldn’t find anything that really explained it in simple terms. It took me a while to figure out exactly what groups and sections and fields were. The problem was that there were no illustrations, or detailed explanations of exactly what was going on. The example code wasn’t always that great either, and was hard to follow. This my be a unique experience, and maybe others catch onto the API much quicker. But for those like me who are looking for a little bit better documentation, here it is. A complete working sample is at the bottom of the page. Enjoy! If you are using the Settings API, you are might be thinking of creating a new settings page. Actually, that isn’t necessary, and if your settings fit in somewhere on one of the preexisting options pages, you might want to consider just putting them here instead. But in many cases, that really doesn’t make sense. So here is how to create your own settings or options page. For this, you can use the add_options_page() function. (If you don’t want your options page under the settings menu, then you will want to use the add_menu_page() or add_submenu_page() functions instead.) The function takes 5 parameters, which are illustrated below. The page title (shown in the browser title bar, etc.). The menu title (shown in the menu). The minimum capability required to access the page (you will probably want to use 'manage_options'). The name of the function that will output the page’s contents. As you can see, we need to hook this function to the 'admin_menu' action. // Output the settings sections. // Output the hidden fields, nonce, etc. This function creates a form, inside of which we call several functions. 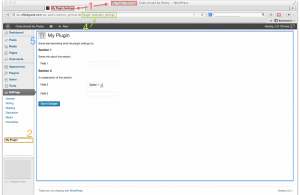 As you can see, the form will POST its data to the options.php page. This is important, because unless you set the action to point to options.php, your data wont automatically be saved. Don’t worry though, this doesn’t mean that you have to use the API only on admin screens registered as sub-menus of the options page; after the data is saved the user will be redirected back to wherever they started. And if you are using the Settings API on an admin screen that isn’t a child of the options admin screen, you’ll want to add a call to settings_errors() to the top of your screen, to display any errors (and, unintuitively, the success message when all goes well). Within the form, we first call do_settings_sections(), which displays the settings sections which I’ll show you the code for in a moment (see image below). Then we call settings_fields(), which adds some hidden fields (called an options group) to go along with our sections (we’ll talk about this more a little later, too). Then we add a submit button, with the aptly named submit_button() function. The hidden fields for a particular group are added to a form using the settings_fields() function. The parameter for this function is the group’s name. 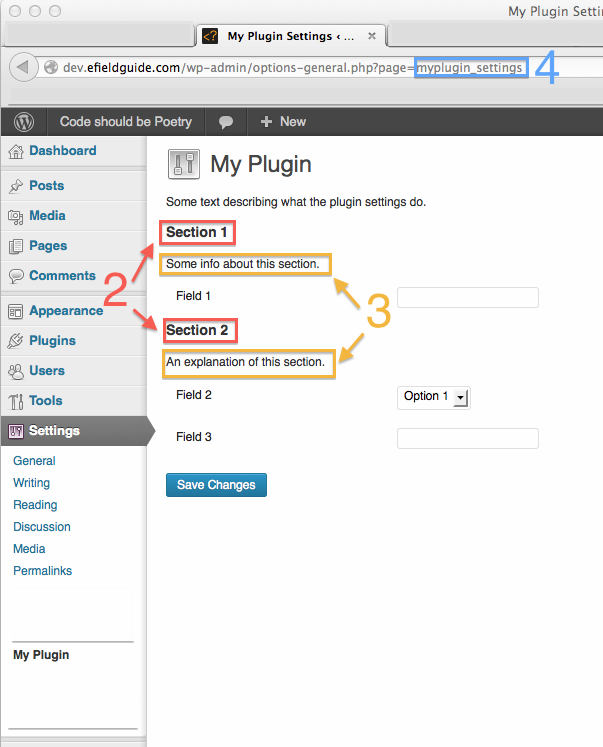 When an option is updated, WordPress checks to make sure that it was submitted along with the group it is registered with. A section, as you can see in the images, is a group of input fields under a heading and some text. 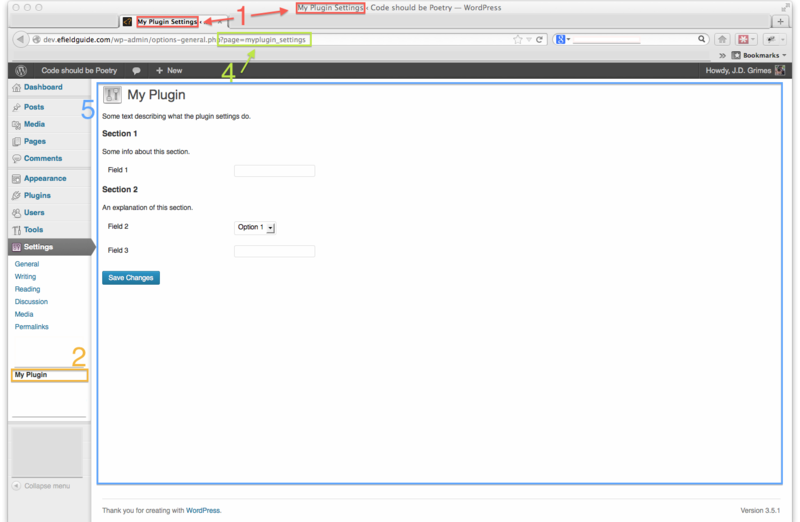 The setting sections registered with a page are displayed by calling the do_settings_sections() function. 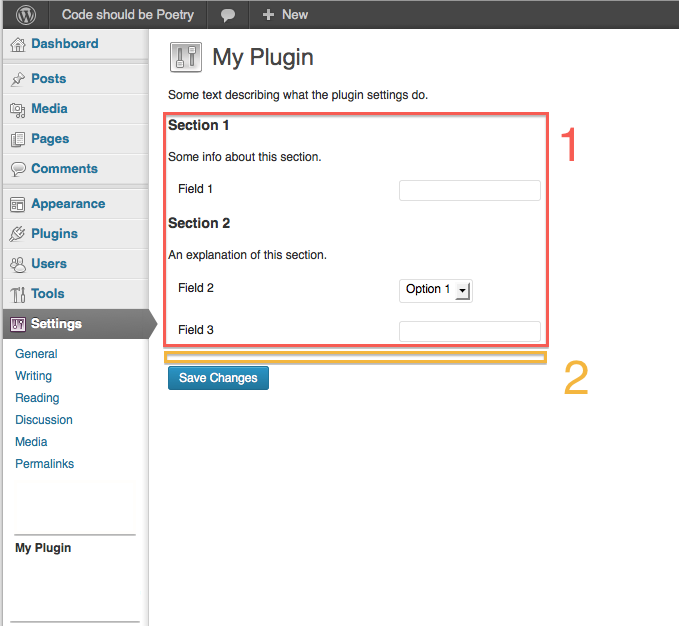 All of the setting sections registered with that page will be displayed. The name of the function that will display the section’s content. The page to display the section on. The result of that on the page is illustrated below (the second section was added in the same way). The callback function (parameter 3) is fired right below the section heading. You can use that to add an explanation of what the section’s settings do, etc. The text of the field’s form label. The name of the function to use to generate the form field. The page to display the field on. The section to display the field under. As you can see, the first parameter is the field’s slug, the second is the value you want it to have. In this case we are creating a text input. The name and id attributes need to match the setting field’s slug. We assign the current value of that option to the value attribute, so we know what the current setting is. The name of the group we want to register the field with. When we put all the code together, and add in the code for the other section and two more fields, it will look something like the code shown below. // Register this field with our settings group. // This example input will be a dropdown. // We make sure the current options selected. // Output the form input, with the current setting as the value. This is the code used to generate the example page shown in the images. Feel free to copy it, and modify it to fit your needs. I hope you have found this tutorial helpful. If you have any comments, please leave them below. 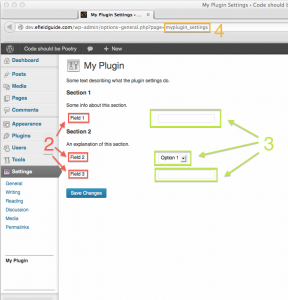 This entry was posted in WordPress and tagged Settings API, WordPress on February 9, 2013 by J.D. Grimes.